Other parents will be begging to know your secret! Does any of this sound true for you? Then it’s time to get you + your baby sharing the same language so you can calm the chaos, regain control, and begin parenting with ease, confidence, and grace. You get a delightfully fun digital class that you can access instantly. Start whenever you are ready + work at your own pace. You could easily binge the content during nap-time, or pace yourself by focusing on ONE core module each week. I personally recommend both! First, binge the content — Then, pace yourself by teaching your baby 3-5 new signs each week. : Starter Signs — 10 magical baby signs that turn “crying” into “communication” — on a daily basis! : Food + Drink — 21 mealtime signs to help reduce mealtime battles. : Action, Transition, and Safety — 13 signs to help you move through your day (without going crazy). : Family — 6 signs to help your little-one connect with loved ones. : Manners — 6 signs to teach your child to be gracious + grateful. : Playtime — 7 signs to delight your child through music + play. : The best age to start signing with your baby. : HOW and WHEN to introduce each sign in the right context. : Steps to keep you from getting overwhelmed. PLUS these 6 Bonus Lessons! : Little Miss Muffet — A simplified version of Little Miss Muffet using ASL signs. : Valentine’s Day — 12 fun ASL signs to connect on love day. : Easter Egg-citment — 13 playful ASL signs for Easter weekend. : Halloween — 11 spooky ASL signs for Halloween… Mwah ha ha ha! : Christmas — 27 enchanted ASL signs for the holiday season. It’s simple, it’s fun, and it works! Hey, I’m Marcie Paige — So nice to meet you! With the help of my two daughters, Michaela + Amber, we lovingly created this course to help other families experience the same closeness + joy that baby sign language has brought to our family. I typically work with new moms who are secretly worried about not knowing what to do when baby cries + feeling overwhelmed about “doing it alone” after dad returns to work. I use a swirly blend of early language development + mindfulness to help parents calm the chaos, regain control, and get over the fear of not doing everything right — while making each step feel like a playful adventure. And when I’m not teaching moms how to communicate more clearly with their little one — you can find me in the kitchen batching paleo freezer meals, binge-watching the latest Netflix TV drama series, or sipping on a seasonal Starbucks latte while mapping out my next business project. I’ve been an entrepreneur for over a decade, and I’ve been teaching baby sign language for about 7 years. : You are a parent, grandparent or family member wanting to connect + communicate more clearly with a pre-verbal child (of any age). Meaning, a baby who hasn’t learned to talk yet, or a toddler with a limited vocabulary. : You are a complete beginner to baby sign language. No prior knowledge is needed for this class. : You are a pre-school teacher or day-home provider who is interested in teaching sign language to the children in your care — or learning to communicate more clearly with signing children who are already in your care. : You are a self-starter and learn best through a guided step-by-step lesson plan. : You are a visual, auditory, and tactile learner. This is a video course with audio, printable posters, and guides. : You want to learn proper sign language grammar, rules of the language, sentence structure, or sign language history. : You’ve already signed with a baby before, and you want to learn more advanced sign language skills. : You are not a self-motivated person. You thrive in social gatherings and learn best through live group activities where you have someone to socialize with and hold you accountable. Parents who have taken this class for a test drive have told me “We never really went through the terrible two stage!” and reported results like “My child was calmer + more content!” and “I was surprised my 14 month old could tell me his friend needed help.” Yeah! That’s what I’m talking about! 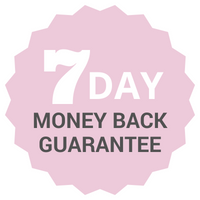 By purchasing this program, you are getting my 7-day risk-free money-back guarantee. If you start the program and you don’t get the results you were looking for, email me at marcie@marciepaige.com and I’ll give you a full refund. How does a digital class work? Do I get stuff in the mail? My programs run solely over the internet – you’ll receive course materials as online videos, audio files (MP3′s) or ebooks (PDF’s). You can access them online, download and use them on your computer, or print them. You will need to have at least basic computer and internet skills, and internet that is faster than dial-up speed. These digital classes are not available by print over snail mail. This class is ideal for parents, grandparents or other caregivers who are new to baby sign language and are ready to start right away. 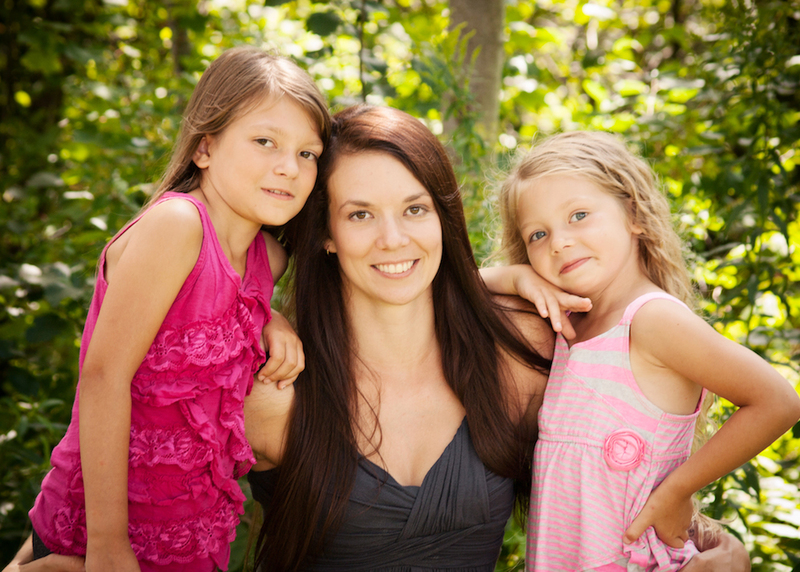 You are a stay-at-home mom or the primary caregiver. The ideal age to start signing with your baby is between 4-12 months. However, if you have an older baby or toddler, it’s not too late to start! Sign language will greatly reduce communication frustration, even though you’ll be using this tool for a shorter period of time. It is also a great resource for pre-school teachers and day-home providers wanting to introduce basic sign language skills to students. YOU are the best person to teach your baby sign language and this course will give you everything you need to succeed. I’ve heard baby sign language can delay speech. Is that true? Extensive research has been done and I’m happy to report, signing with your baby does NOT delay speech! Research has shown that most children who use sign language learn to speak sooner and have a much larger vocabulary. I started signing with my daughters when they were 6 months old and they both started talking early on. And to this day, their vocabulary bank continues to amaze me. What is the best age to start signing with my baby? … OR is it too late to start? The ideal age to start is between 5-8 months, but it is never too early to start learning. If your baby is still young (under 6 months), you will have plenty of time to get comfortable with signing and make it a habit early on. Since you have ongoing access to the classroom you can come back later to brush up on signs you’ll need when your baby gets a little older. If you have an older baby (14 months and up) and are just starting to realize the benefits of baby sign language, you may be wondering if it is too late to start. The short answer is NO, it’s never too late! Toddlers know exactly what they want and get extremely frustrated when they can’t communicate their wants to you. It’s not too late if your child is not talking yet, or still has a limited vocabulary. There are several free online dictionaries to learn American Sign Language from, what does Adventures In Baby Signing offer that free resources don’t? I learned American Sign Language when I was 18 but had no idea that baby sign language was being used as an early communication tool for hearing babies until I was expecting my first child. So, even though I already knew how to sign I was at a complete loss at HOW to teach sign to my baby, and WHICH signs I should teach her. Through research and experimentation, I learned what works and what doesn’t, and I created a course to help you shorten the learning curve. I love that I can learn baby signs through video lessons (much easier than a book! ), but it’s kind of a pain to log into the website when I just need to jog my memory for a sign I forgot the hand shape for. No problem! I’ve had a professional graphic designer create ‘quick-reference posters’ for each of the 6 core lessons. Just print out your poster and hang it on your fridge for easy reference. Once you’ve watched the videos to learn the proper technique and motion, all you need is a quick glance at the poster to jog your memory. When do I get access to the course, and for how long? You will get access to the course immediately after you submit payment through PayPal. What happens after sign up? Once payment is received, you will be redirected to a registration page where you will be required to create a username and password. Once this step is complete, you will have immediate access to the classroom. Absolutely! Supporting you and answering your questions is extremely important to me. There are multiple ways to reach me. You can post a question on my Facebook page, make a submission through the Contact page in the Classroom or email me directly at marcie @ adventuresinbabysigning.com (remove the spaces). You get lifetime access with your membership to this course. If life gets a little crazy, you have another baby, or need a refresher – come back anytime you like! *Payments made securely through PayPal’s site. 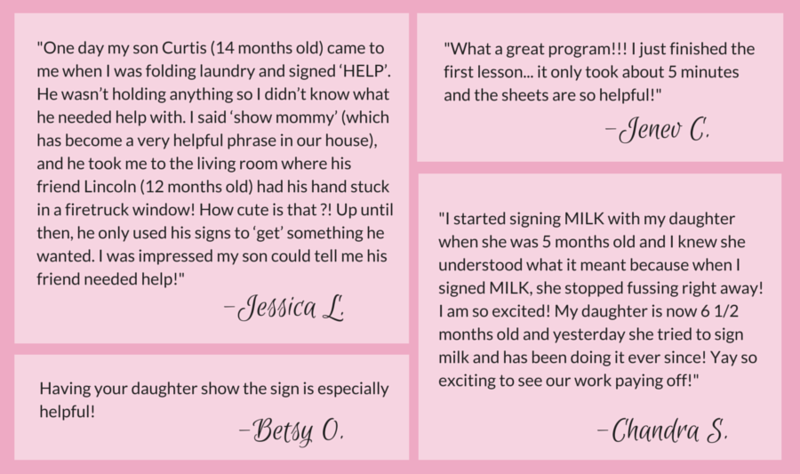 © 2014 – 2019 Adventures In Baby Signing All rights reserved.